When Jill reviewed this book, I thought it sounded fascinating, but potentially terrible. The author, Rachel Bertsche, had newly moved to Chicago to be with and marry her boyfriend, but in the few years that she’d been there, she’d been unable to make good longterm local friends. 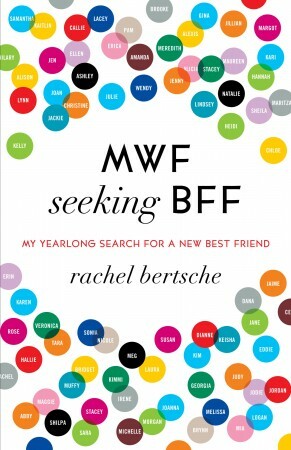 She set out on a journey to go on 52 “friend dates,” one per week, throughout a year, to try to find a few good local BFFs. Like I said, it could be fascinating, but it might also be terrible, if said dates turned into chick-lit types or massive alcohol types. Yeah. Thankfully, the book turned out to be pretty good. I don’t do friendship the same way as Bertsche, but I enjoyed reading about what she did and how she worked at this for a year. She included a lot of good research on friendships and relationships in general, and again, while I don’t agree with everything she reported, I thought a lot of it was interesting. It also made me wonder about friendships in my own life, since I tend to have very small circles and don’t really feel the need to have anything beyond that. Plus, my circles include, say, my cousins and husband, and I can’t imagine anyone else ever being as close to me as a cousin or husband. Then again, I don’t do family the same way most people do either! It’s been a long time since I had call-up-and-hang-out-with friends. I had them pre-marriage, and haven’t really gotten them back after several cross-country moves and the involvements of child-rearing and being a stay-at-home-mom.Those people I’ve grown semi-close to over the years have never developed into super-close friends. Maybe I’m just not in the right place, as I know the culture here clashes with me, and of course I don’t work, so there’s no place to look for friends there. Periodically, I find someone online that I get along well with, but inevitably, they live across the country from me. Sigh. I miss that, though. Every time I read a Brandon Sanderson novel, there’s a heavy emphasis on friendship, and that makes me nostalgic for friends in the non-family sense. But honestly, I don’t think I have the creativity or energy to go about a project like Bertsche did. I’m glad to be a bit more self-aware after reading the book, and I think I’ve learned a few ways I might boost my friend circle in the future as well. It has certainly made me more open to social invitations, particularly with my local writer’s groups, and I’m trying to put myself out more often. Maybe that’s the first step. This entry was posted in 2013, Adult, Prose, Wellness and tagged humor, memorable, nonfiction. Bookmark the permalink.